Step 5: What Comes First: Theme or Mechanic? I don’t think we even need to discuss where ideas come from. If you’re really looking for game ideas (and many times when you’re not) you will find them in almost everything. Eventually, when people know that you like to design board games, you’ll find that they often recommend turning a current situation you’re in with them into a board game. Some people have asked what comes first though – is it the theme or the mechanic? Well there are actually a few more variables that could come first, such as: Title, Genre or Components. Theme: I would hazard a guess that a lot of games start with the theme. “Hey wouldn’t it be cool if there was a game about trying to escape a mall infested with zombies?” Theme is what gives the game a unique flavour and often will help drive some of the mechanics. I used to work for 7-11 back in the day and I remember learning that candy bar manufacturer’s pay more money to 7-11 to be placed on the top shelf, instead of a lower one. Makes sense – and it was the theme I liked that motivated us to make our very first finished board game called Top Shelf. It’s never been published, but it still has its place in our history of game design as being our first design! With just that theme we came up with a tile placement game where you’re trying to make matches to get more of your product sold than your competitors. I showed Top Shelf to a company at a convention and they liked it enough and asked us to send them a prototype. They asked us to take the theme out of the game and just make it a completely abstract game as that was the kind of publisher they were. We obliged but as we did so I felt the game lost some of its magic. Possibly that’s just me as I’m more of a fan of theme-based games than abstract games that have no or minimal theme. I like to feel like the game is telling a story as we’re playing it. Mechanic: Sometimes we come up with a mechanic first – like tile laying, pick up and deliver, resource management etc… As we fine tune some of the concepts, we throw around some possible themes that might fit. Eventually we lean more to one theme and progress from there. I had this idea for a tile laying game that had some pick up and deliver mechanics to it. As I started to develop it I made it about delivering various meats on something I called a Smokeboat. Later as the game kept improving we moved the theme over to the Greek Islands and the game became Santorini. It still has the pick up and deliver mechanic but it fits much better with the theme. “Dang, that should be the name of a board game!” Well, I think that at least! For us we’ve had these titles way before designing any aspect of the theme or mechanic: Pants on Fire (seemed like it would be a great game with bluffing), Mage vs. the Machine (seemed like a cool battle game concept),Hog the Remote (seemed like some sort of quick reaction game about TV) . Some of these made it to prototype phase and Hog the Remote has ever been to a couple publishers already. We actually have a thread on our forum dedicated to possible game titles. Genre: Since we’re trying to be as well rounded as possible when it comes to designing board games, we want to explore every possible genre of games: kids/family, dexterity, Euro-strategy, war simulation, party games. In my other spare time I work as a children’s entertainer as a character named Bertolt. I thought it would be great if Bertolt had a game of his own. So we set out to create our first kid’s game. We toyed with an idea about Bertolt packing clothes for a trip, but it didn’t work. We then came up with this concept of quick reaction mixed with audible clues. It turned into Bertolt’s Jungle Jam. Eventually it became just Jungle Jam when we pitched it to publishers as they wouldn’t know who the heck Bertolt was. Currently it has been retitled again as it shares the name with a game that was in a court battle against Jungle Speed. We don’t want to be associated with that at all! But our game does actually involve making jam, so we’re now calling it Jam Slam. It’s currently in the semi-finals of a contest for best Canadian Game Design! Game Components: This is more rare, but it’s possible an entire game can be started because of seeing something you’d like to see in a game. Often Sen and I will go to school supply stores and just walk up and down the aisles. Those stores are great because they often have things in the main primary colours – and in huge quantities. 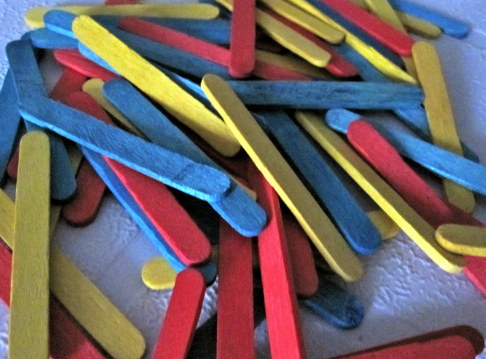 One great example is seeing these miniature coloured popsickle sticks at a dollar store. We bought them for no reason except they seemed like they could be cool. These sticks have sat in our supply box for a couple years doing nothing. Then just about a month ago I had this idea on how to use these sticks in a game. We’ve spent the last couple of weeks working hard on it and we’ll need to spend many more to get the balance just right, but we’re excited about our new game, possibly called Rune Masters. So there is no correct answer as to what should come first when designing a game. I think that’s part of what makes designing board games so interesting. Anything can get you started about making a game. Starting with this post I’m going to add some Game Design Challenges. If you want to flex your designer muscles then give them a whirl. The goal is to be a more well rounded game designer who is able to design any game if requested (imagine having that job?!). This post brings back a lot of great memories, but even moreso, it brings to light an important aspect of our design philosophy. The “V” from your MVP mnemonic – being able to see the possibilities in all sorts of things and to be able to take the mundane, turn preconceived notions on their ears, and make something fun out of a bunch of cubes and a piece of cardboard is what game design is all about. And then, from that sandbox-type free-for-all, being able to reign things in and create a viable ruleset…wow. It’s a process, but a great one. Write a description of 5 possible games. Each game should start from a different point: Theme, Mechanic, Title, Genre and Component. You don’t have to design the actual game or even any rules, just write a sentence or two about how each would work.